For one serving, add two scoops of powder (60 g) to 300 ml of water, shake to blend and enjoy! isolate (milk), hydrolysed whey protein (milk)), maltodextrin, Lglutamine, creatine monohydrate, soya oil powder , calcium betahydroxybetamethylbutyrate, medium chain triglycerides , flavouring , sweeteners ( sucralose , acesulfame K), thickener ( cellulose gum), colour (curcumin ), zinc oxide. 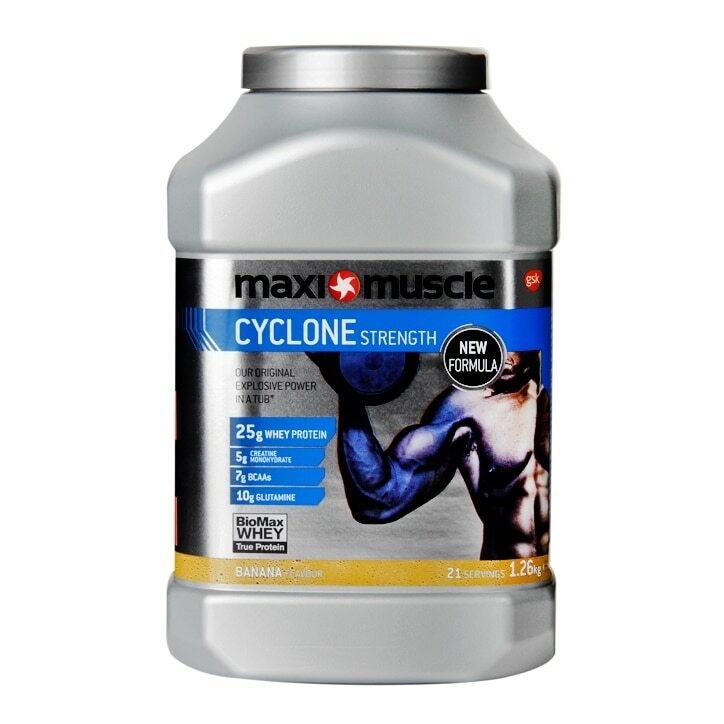 MaxiMuscle Cyclone Powder Banana is rated 4.7 out of 5 by 3. Rated 4 out of 5 by Cydoe from Great and reliable product Great product! ; used it a few years back , but disappointed after a fruitless search in the Netherlands for more. Happy to atlast lay hands on it again. Thanks to Holland and Barret. Rated 5 out of 5 by Tina2404 from Great features I bought it two weeks ago and is great product, I will use it frequently from now on.